B.C. Transportation Minister Claire Trevena announced Wednesday that Jacob Bros. Construction Inc. of Surrey won the contract to build a priority bus lane from Tolmie Avenue to the Burnside Bridge, where Burnside and Interurban roads cross under the Trans-Canada Highway. The project was put on hold last year due to high bidding costs and the government re-issued the tender in November. Officials initially pegged the cost at about $12.75 million before detailed design work was done. “Now that all the property has been purchased and construction costs and schedules are confirmed, the total project cost has been adjusted to $14.2-million,” the Transportation Ministry said in a statement. The province will cover $9.6 million of the final price tag, with the federal government kicking in $4.6 million. Once complete, the lane will link with the City of Victoria’s completed bus and bike lane from Fisgard Street to Tolmie Avenue. The next section, due for completion in 2019, will extend the route from Burnside Bridge past the McKenzie interchange. The government has yet to set a timeline for finishing the lanes all the way to the Colwood turnoff at the Old Island Highway in View Royal. But Saanich Coun. Susan Brice, who chairs the Victoria Regional Transit Commission, said she’s had a number of meetings with Trevena and is optimistic that the work will get done. “I think that the ministry’s goals are the same as the transit commission’s,” she said. 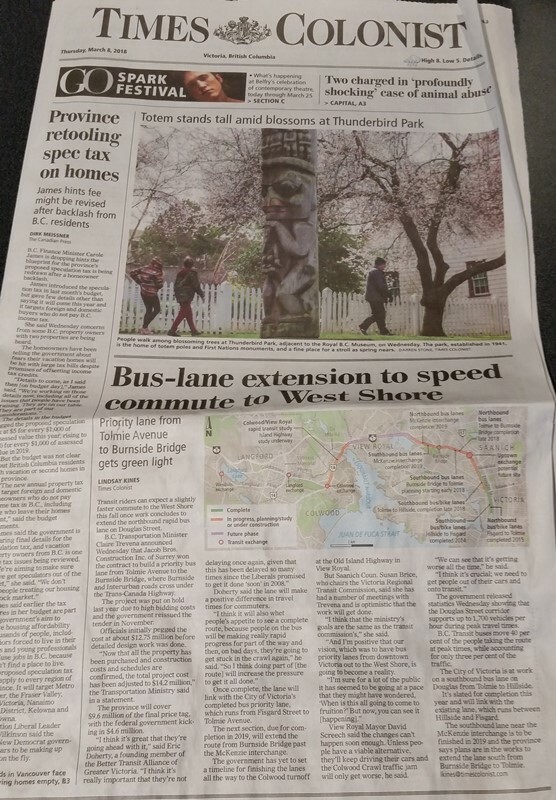 “And I’m positive that our vision, which was to have bus priority lanes from downtown Victoria out to the West Shore, is going to become a reality. View Royal Mayor David Screech said the changes can’t happen soon enough. The government released statistics Wednesday showing that the Douglas Street corridor supports up to 1,700 vehicles per hour during peak travel times. B.C. Transit buses move 40 per cent of the people taking the route at peak times, while accounting for only three per cent of the traffic. The City of Victoria is at work on a southbound bus lane on Douglas from Tolmie to Hillside. It’s slated for completion this year and will link with the existing lane from Hillside to Fisgard. The southbound lane near the McKenzie interchange is to be finished in 2019 and the province says plans are in the works to extend the lane south from Burnside Bridge to Tolmie.